The worst customer situations demand more of front-line employees than good intentions and the right attitude. These kinds of issues can send seasoned service professionals into red alert, and require the communication skills of a crisis counselor. 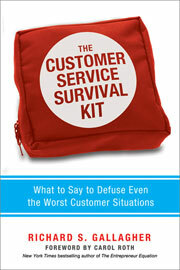 The Customer Service Survival Kit explains how to use the right words to turn volatile scenarios into calm and productive customer encounters. Anyone can learn this delicate art with the book’s blend of clear techniques, lessons from behavioral science, case studies, situation-specific advice, and practice exercises. Readers will discover: • The power of leaning into criticism • Trigger phrases that can make bad situations worse • The secret to helping people feel deeply heard in a crisis • How to use the divide-and-conquer approach to safely deliver bad news • Indispensable problem-solving tools • How to become immune to intimidation • How to wrap up transactions so that customers are happy • And more! Best yet, learning to handle worst-case scenarios has the spillover effect of boosting the skills and confidence needed to deal effectively with ANY customer—the key to radical improvements in every organization.